Wall sculpture in brass and chrome by Curtis Jere, signed. 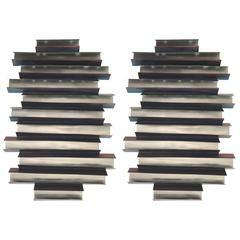 Folded steel wall sculptures with pink and blue highlights by C. Jere 2007, signed. Can hang vertical or horizontal. Patinated brass eagle sculpture on marble base by Curtis Jere. 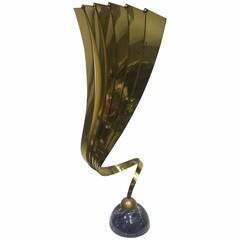 Brass and marble sculpture designed by Curtis Jere, signed. A large Jere sunburst wall sculpture with a wire pom forming the center surrounded by large wire forms in stainless steel, brass and copper. Manufactured by Curtis Jere, California. Reproduction of the original by Curtis Jere. Produced by same company as the vintage models, Artisan House. Chrome finish. Wonderful rarely seen Curtis Jere wall sculpture. Brass, circular form wall-mounted sculpture by Curtis Jere. Measures 38 inches in diameter. C. Jere tree wall sculpture with Brutalist details to branches, signed and dated 1986. Sculpture is made in two sections. The one shown is sold, new photos coming soon.